Last night, Emporio Armani hosted Volume 3 of their Sounds x Standard Sounds Music Series at the Standard Hotel High Line. 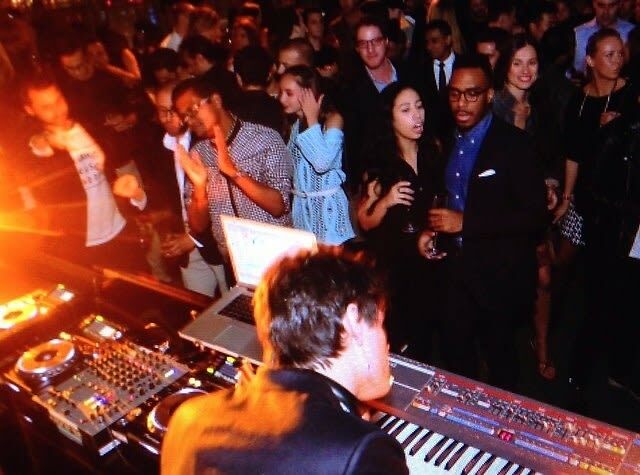 Guests enjoyed DJ sets by Clarian and Seth Troxler against a beautiful NYC backdrop. While some guests got up close and personal at the DJ booth, others mingled poolside for drinks and conversation. Who was there: Guests included Clarian, Seth Troxler, Arman Nafeei, Adrianna Zaretsky, Meghan McLellan, Rod Manley, Snow Xia, Camille Dz, Francis Cho, Inna Iof, Lou Desremaux, Vladimir Restoin Roitfeld, Wael Mechri-Yver, Anya Thompson, Barbara Jansen, Candice Taylor, Cristina Donnelly, Emma Jepsen, Marieke Bigg, Robyn Thompson, Roxane Glineur, Alisar Ailabouni, Angela Christos, Antina Esteban, Anya White, Cecilia Pagkalinawan, Eloise Jacobs, Eva Schouten, Fernanda de la Puente, Gillian Hodes, Joanne Bolens, Julia Amber, Julian Tobias, Kate Gosparovich, Kelsey Garrison, Kristin Knapp, Laetitia Loffredo, Larissa Theilinger, Laureline Calastreng, Leonore Aellen, Luz Pavon, Madison Massey, Marian Kurpanov, Marie-Luise Goldmann, Mattia Bogianchino, Myles Pimental, Nastia Devesty, Olivier Von Themesche, Rosario Mayorga, Silvia Mella, Sotiris Panagiotopoulos, Victoria Pavon, and more.